Source: U.S. Energy Information Administration based on EIA 860 and Ventyx data. 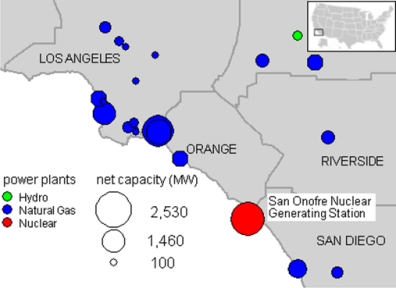 The January 2012 outage at the San Onofre Nuclear Generating Station (SONGS), located just north of San Diego, changed the California electricity market. SONGS Units 2 and 3 provided the market with a consistent source of baseload electricity since the units began operating in 1983 and 1984 (Unit 1, which began operating in 1967, permanently shut down in 1992). 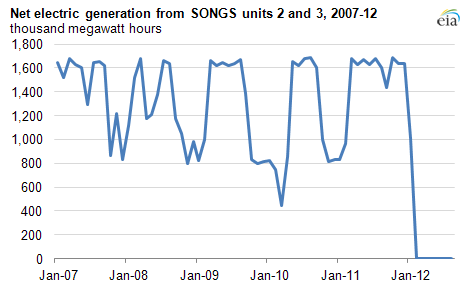 The loss of SONGS is a significant contributor to changes in the California electricity generating profile over the past year. The SONGS facility is composed of two pressurized water nuclear reactors that together have a rated net summer capacity of 2,150 megawatts (electric). Nuclear power plants such as SONGS are important sources of baseload electricity because of their high output capability and low variable operating costs. SONGS played an important role in the electricity generation profile of the region as a result of its high output and location in the electric demand center of Southern California. Between 2002 and 2011, SONGS generated an average of 16,218,635 megawatt hours of electricity each year. This generation represented 18% of the total electricity generation in the Southern California Edison and San Diego Gas and Electric California ISO zones during this period. The units operated at full capacity during the summer, when demand was highest; output was lowest when either of the units underwent a refueling outage. Both units went offline this January and remain shut down, creating challenges for the Southern California electric grid. Source: U.S. Energy Information Administration, EIA Form 923. Electricity demand between 2011 and 2012 remained essentially unchanged, leaving California utilities to deliver the same amount of electricity to customers without one of the largest in-state suppliers. In addition to the loss of generation by SONGS, in-state hydroelectric power generation was lower through July of this year. Increases in generation at natural gas-fired power plants in the state offset the reduced nuclear and hydro generation. Natural gas generation was up through July 2012 by 24% when compared to the same period of 2011. Lower natural gas prices, in general, have moderated the increase in operating costs caused by using natural gas instead of nuclear generation in California so far in 2012. Average on-peak power prices in Southern California in 2012 so far are lower than in 2011, despite increased natural gas demand. The average on-peak wholesale price of electricity in Southern California through July 2012 was $30/MWh, down from $37/MWh during the same period in 2011. On the other hand, the average off-peak wholesale power price during this same period in 2012 was $21/MWh, up slightly from last year's price of $19/MWh. This was due to natural gas replacing nuclear power as the marginal fuel in Southern California during off-peak hours. The variable operating costs of nuclear power are very low, and it is often the marginal fuel during periods of low demand. The reduction of available in-state supply resulted in California importing more electricity. Electricity imports through July 2012 were approximately 90 percent higher than in the first half of 2011. California historically imported significant amounts of electricity, since its wholesale power markets in the region are relatively open and generation from outside the state is often less expensive. Some power plants located in adjacent states are partially owned by California utility companies, and special agreements exist for exporting power to California. For instance, 18% of the Palo Verde Nuclear Power Plant, located in Tonopah, Arizona, is owned by California-based utilities. Outages at the SONGS nuclear plant have also affected the natural gas market. According to Bentek Energy, natural gas demand by Southern California Natural Gas—a local distribution company providing retail natural gas service to Southern California—was up 262 million cubic feet per day, or 10%, so far in 2012 (Jan. 1-Nov. 8) compared to the same period in 2011. To meet higher demands, flows on interstate natural gas pipelines such as El Paso Natural Gas and Transwestern delivered more natural gas into Southern California. Because of these increased natural gas deliveries, the spreads between the price of natural gas at Henry Hub and key price benchmarks in California—the SoCal Citygate and the PG&E Citygates trading points—rose on average about $0.16-$0.20/MMBtu (Jan. 1-Nov. 8), even while average spot gas prices went down. Further, the premium between natural gas priced at the PG&E and the SoCal Citygate trading points fell on average to $0.09/MMBtu in 2012 (Jan 1-Nov 8) compared to the same period in 2011. Note: California's electricity imports were estimated by subtracting total in-state generation from the EIA Form 826 from total in-state generation from the EIA Form 923. Renewable energy in the chart includes: wind, photovoltaic, geothermal, and biomass.